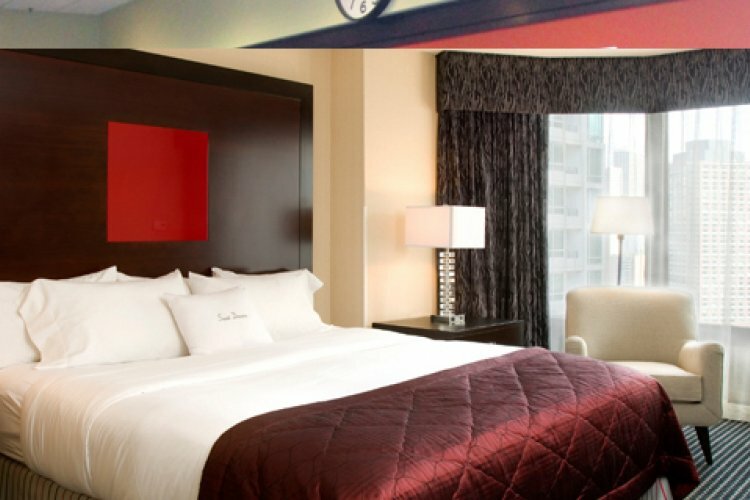 Doubletree Magnificent Mile, Chicago is a hotel with a fantastic location between the famous magnificent mile shopping and the Navy Pier. This puts the hotel within walking distance of many Chicago attractions such as the Millennium Park, the Art institute of Chicago and much more. The hotel offers both rooms and suites which cater to all customer needs. The bathrooms have granite counter tops, spa shower heads and high quality bathroom products. High speed internet is available so you can keep in touch with the world and up to date with emails. Work desks are available if you cannot escape the office. 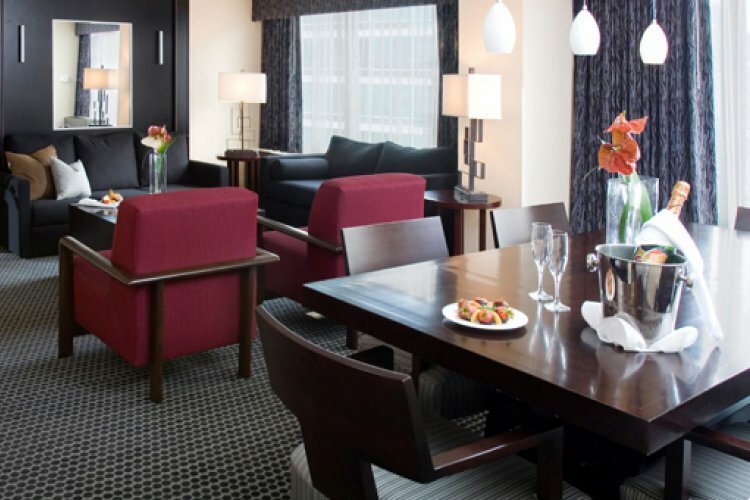 The suites at Doubletree Magnificent Mile are spacious and attractive. Each suite has a Queen Size bed and separate sitting area which gives additional comfort and luxury for guests. The sitting room provides a dining table which is perfect for small celebrations or business meetings. For onsite dining the Doubletree Magnificent Mile provides everything you could want. The Market House offers a large range in cuisine with a variety of poultry, fish and meat, from local producers. Open for breakfast lunch and dinner enjoy the casual atmosphere of this restaurant. For breakfast and lunch visit Einstein Bros Bagels. As the name suggests here you can sample a range of fresh bagels. There are also plenty of breakfast wraps, hot and cold sandwiches and salads to go. The hotel also has a fitness rooms and pool to get keep you in trim shape during your stay. There are also a range of amenities to make visiting with family easier with childrens' menu, cribs, and high chairs. "Spring like in New York. Spring, rain and snow in Chicago"
"Mostly hot and sunny, but we did encounter thunder storms, hailstones and even snow in Flagstaff." "Rainy & cold at first but the sunny and hotter as we headed west." "Mixed but generally warm and dry"
"Mixed. we have sunshine, rain, wind and storms - but it didn't matter." "PERFECT, just right for us." "Hot, in the 70 / 80's the whole time." "Stormy but warm around 28c." "Fantastic for the time of year..mainly very warm and sunny"
It was a different kind of holiday but brilliant being taken round these places by people who live there. We visited Montreal and the mountains north of Ottawa. Very different from one another. Chicago buzzy and pacey. Architecture amazing. Ottawa quieter more laid back not high rise. Can throughly recommend both destinations.